One of the objectives of CGFA is to provide opportunities to donate to the community. We do this in many ways. This program provides quilts for youth and teens facing challenging times in their lives. children receiving care in the crisis nursery at The Children's Cottage Society. All quilts go home with the children or teens when they leave the facility. Since 2012 we have been finishing and donating close to 300 quilts each year. Fundraising is a necessary part of the Quilts for Kids program and every year we organize a quilt sharing event "Spring Fling" to showcase many of the quilts we have made before they are distributed. Representatives of our recipients, donors, members and guests attend and share their experiences in the success of this initiative. All funds raised at this event go to cover the cost of fabric, batting, as well as machine quilting services. Display from the Quilts for Kids "Spring Fling" event held May 2014. 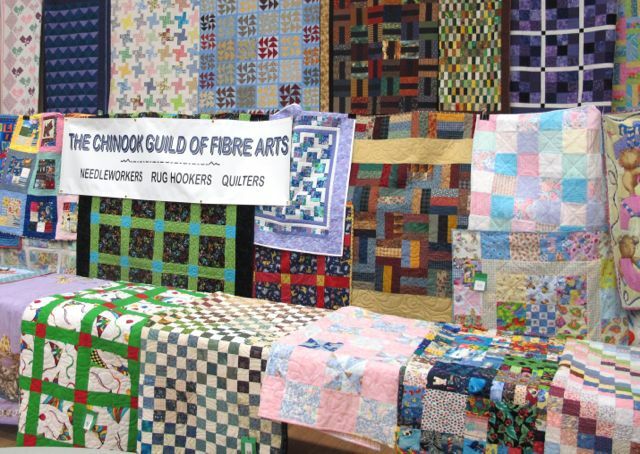 We also sew quilts for Quilts of Valour - Canada Society. Our mission is to ensure that Canadian Forces are recognized for their service and commitment of our country. We give this support through the presentation of quilts to comfort our past and present Canadian Forces members. A Quilt of Valour is a "hug from the nation" to a CF Member who serves and makes sacrifices for our country. The quilt standards must reflect the level of gratitude that we want to demonstrate to our receipient. In all cases we request that the standards we have established are followed to ensure that a high quality symbol of gratitude is presented. Our needleworker members work on a variety of knitted and crocheted projects including preemie and baby blankets, mittens, toques, slippers and sweaters. These items are given to the Calgary Health Trust (which includes hospitals in the Calgary area) Kara Life Program, Children's Cottage, Louise Dean School and the Bethany Nursing Home.